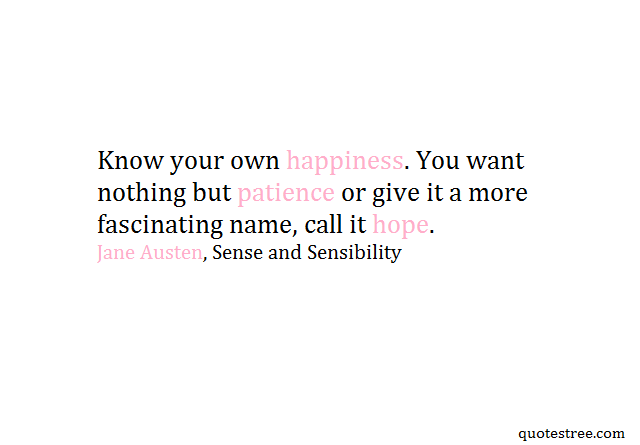 Sense and Sensibility is the first published work of Jane Austen and it appeared in 1811 under the pseudonym "A Lady." The novel portrays the life and loves of the Dashwood Sisters, Elinor and Marianne, it follows the young ladies to their new home, a small cottage on a distant relative's property, where they experience love, romance and heartbreak. Know your own happiness. 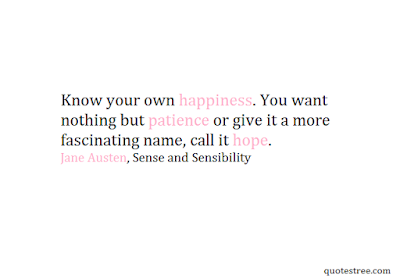 You want nothing but patience- or give it a more fascinating name, call it hope. I never wish to offend, but I am so foolishly shy, that I often seem negligent, when I am only kept back by my natural awkwardness. [...] Shyness is only the effect of a sense of inferiority in some way or other. If I could persuade myself that my manners were perfectly easy and graceful, I should not be shy. Money can only give happiness where there is nothing else to give it. As moderate as those of the rest of the world, I believe. I wish as well as every body else to be perfectly happy; but, like every body else it must be in my own way. Greatness will not make me so. Life could do nothing for her, beyond giving time for a better preparation for death. But remember that the pain of parting from friends will be felt by everybody at times, whatever be their education or state. Know your own happiness. You want nothing but patience; or give it a more fascinating name: call it hope. Sometimes one is guided by what they say of themselves, and very frequently by what other people say of them, without giving oneself time to deliberate and judge. She was stronger alone; and her own good sense so well supported her, that her firmness was as unshaken, her appearance of cheerfulness as invariable, as, with regrets so poignant and so fresh, it was possible for them to be. At first sight, his address is certainly not striking; and his person can hardly be called handsome, till the expression of his eyes, which are uncommonly good, and the general sweetness of his countenance, is perceived. Though where so many hours have been spent in convincing myself that I am right, is there not some reason to fear I may be wrong?